The United States Special Operations Command (USSOCOM) and the Air Force Special Operations Command (AFSOC) have successfully conducted initial testing of the Block I variant of the Dynetics GBU-69/B Small Glide Munition (SGM) incorporating a two-way datalink. Flight tests, conducted in February achieved all test objectives including sending via the datalink updated target coordinates from the launch platform to the SGM, redirecting the munition to a secondary target located more than a mile from the initial target location and transmitting an in-flight command to inhibit munition arming. The munition also transmitted critical data such as its position, velocity, flight mode, and arming status back to the launch platform. Acknowledgement and verification of commands sent to and from the munition were verified via the Battle Management System on board the launch platform as well as a ground control station. Additionally, the SGM laser seeker was used for terminal guidance yielding a CE90 strike on the updated target coordinate. Dynetics initiated work with Raytheon Integrated Communications Systems to integrate theX-Net radio in 2017. Due to the highly collaborative design effort between the two companies, the SGM was able to accommodate the new hardware component within existing size, weight and power (SWaP) allocations for the munition electronics. A Dynetics-designed deployable mono-pole antenna, stowed under the wing prior to launch, is the only external modification made to the Block I datalink variant. The RaytheonX-Net networked radio was designed to provide In-Flight Target Updates (IFTUs) in order to improve weapon performance in dynamic targeting environments and to receive telemetry data for both weapon performance and post-mission analysis. The X-Net is a new small form factor, software-defined, radio that meets the challenging SwaP requirements of small munitions. It is MIL-STD-6016 compatible and supports the SGM's flyout range of over 20 nm. The incorporation of a two-way datalink will greatly enhance the capabilities of the SGM allowing the weapon to be part of a network consisting of other airborne platforms and tactical air controllers. In the future, networked communications will facilitate collaborative strikes and lead to new tactics expanding SGM capabilities and effectiveness. The SGM, which became operational in 2017, was developed by Dynetics working in close collaboration with USSOCOM PEO-Fixed Wing under a Cooperative Research and Development Agreement (CRADA). Dynetics invested corporate resources to develop the munition which was first demonstrated under the CRADA. The munition was tested, qualified and fielded in less than two years. 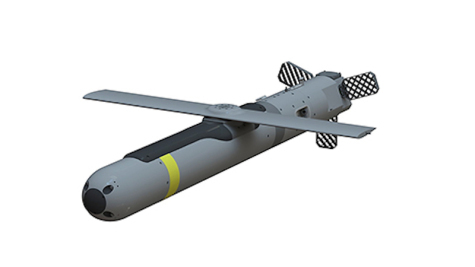 The success of the SGM program was noted as one of the key accomplishments of the PEO-Fixed Wing Stand-Off Precision Guided Munitions (SOPGM) Team which was recently recognized with the 2018 David Packard Acquisition Excellence Award - the DOD's highest acquisition team award recognizing exemplary performance and innovation acquiring and delivering products and capabilities for the Warfighter. Dynetics has increased SGM production capacity in response to a 1000-unit order from USSOCOM in 2018. Other near term planned activities include integration of SGM on Special Operation Forces (SOF) unmanned aircraft and demonstration of a new composite low-collateral damage warhead. Both are scheduled to occur in 2019. The SGM is managed out of the Dynetics Missile and Aviation Systems Division which specializes in the rapid and affordable development of products to meet specific and sometimes urgent customer needs. The division is the Corporation's lead for research, development, prototyping, testing and production of advanced munitions and unmanned systems.